Should I feel guilty that I want my kids to go back to school? One of the fellow moms from my son’s upcoming kindergarten class shared an article from the Huffington Post about a mother sending her little boy off to school. The article promised to be a real tear-jerker judging by the image of the woman and the little boy sharing a tender moment. I started reading it right before bed because, who doesn’t like a good tug at the heart strings, but it didn’t get me teary eyed. In fact, I couldn’t even get past the first part where the author wrote: “I’ll miss our quiet days together.” My thought was: what quiet days together? For a short minute I felt like there was something wrong with me for not relating to this sentimental article. Could it be because he’s my last child and not my first? Shouldn’t knowing this is my last baby make this article even sadder? Am I missing the big picture? 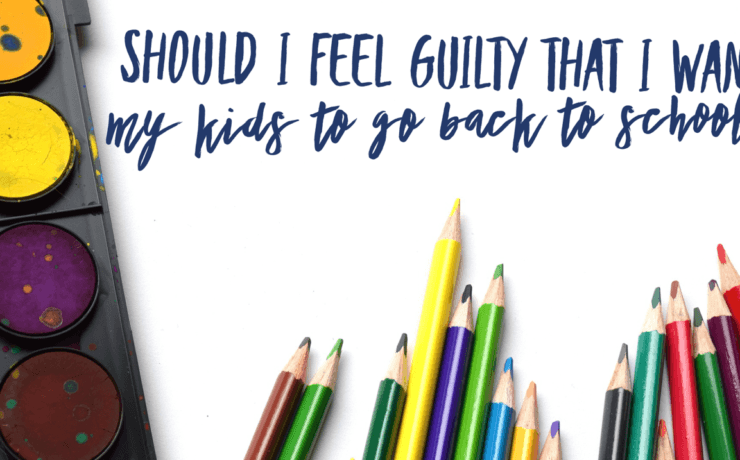 As I was saying this, my mind wandered back to opening that article about the kindergartener and once again I questioned myself: Should I feel guilty about wanting my kids to go back to school? Is there something wrong with me? We’re in an era where we parents are constantly reminded that our time with our kids is fleeting. We are told to enjoy every minute of our time with them because it won’t last. And it’s true. It doesn’t last. But here’s the problem: in our quest to be mindful, present, and grateful, we can easily fall victim to feeling guilty when we’re ready for a new season. I remember reading once that when it comes to raising kids, the days are long but the years are short. Having a son that is almost 10, I can certainly vouch for how quickly the years have gone by. But here’s the thing, the days are long–and if you’re fully invested in your kids– the days can seem even longer. I’ve had a wonderful summer with my kids and I’ve had the luxury and privilege to be fully immersed in their care. This means we’ve traveled together, played together, and stayed up late together. We’ve had a blast! But it also means that I’ve had to say “No!” to watching TV a gazilion times, mediate fights between siblings, force them to set aside reading and math time every day, and beg them to pick up after themselves. There have been as many yelling matches, tears, and time-outs as there have been I love you’s, cuddles, and belly-aching laughter. It also means I’ve fallen behind in work and my routines are out of whack. It takes me twice as long to do things like write or respond to an email (This blog post alone has taken me three days to write). My house has been a loud, rambunctious playground for my 9, 7, and 5 year old boys…and their friends…for three months. Some of my parent-friends are dreading back to school routines, waking up early, and structured days. That’s okay, too. I’m pretty sure by December I’ll be excited for another break from routine. But right now, I’m longing for a few solitary hours to focus on my business so I can continue pursuing my passion while raising my kids to pursue theirs. They’re both important and both deserve attention, and the key is to not let one rob you from the other….at least not all the time. The beautiful thing about ages, stages, and seasons is that you can enjoy them, suffer through them, relish them, and then move on to the next phase. Isn’t that being truly present? In this article, my friend shared wisdom as a man who’s already raised his kids and understands that despite how challenging the process can be, we should be truly grateful for the opportunity. This one hit closer to home and I found myself feeling extra grateful for the fun times I’ve had with my kids this summer. But I still can’t wait for the kids to go back to school. There’s nothing wrong with me for feeling that way…or with you… no matter what you feel.